Packager: Bayer HealthCare Pharmaceuticals Inc.
Screen patients for acute kidney injury and other conditions that may reduce renal function. For patients at risk for chronically reduced renal function (for example, age > 60 years, hypertension or diabetes), estimate the glomerular filtration rate (GFR) through laboratory testing. For patients at highest risk for NSF, do not exceed the recommended Gadavist dose and allow a sufficient period of time for elimination of the drug from the body prior to any re-administration [see Warnings and Precautions (5.1)]. Gadolinium-based contrast agents (GBCAs) increase the risk for NSF among patients with impaired elimination of the drugs. Avoid use of GBCAs in these patients unless the diagnostic information is essential and not available with non-contrasted MRI or other modalities. Gadavist is indicated for use with magnetic resonance imaging (MRI) in adult and pediatric patients (including term neonates) to detect and visualize areas with disrupted blood brain barrier and/or abnormal vascularity of the central nervous system. Gadavist is indicated for use with MRI to assess the presence and extent of malignant breast disease. Gadavist is indicated for use in magnetic resonance angiography (MRA) in adult and pediatric patients (including term neonates) to evaluate known or suspected supra-aortic or renal artery disease. The recommended dose of Gadavist for adult and pediatric patients (including term neonates) is 0.1 mL/kg body weight (0.1 mmol/kg). Refer to Table 1 to determine the volume to be administered. Gadavist is formulated at a higher concentration (1 mmol/mL) compared to certain other gadolinium based contrast agents, resulting in a lower volume of administration. Use Table 1 to determine the volume to be administered. Use sterile technique when preparing and administering Gadavist. Administer Gadavist as an intravenous injection, manually or by power injector, at a flow rate of approximately 2 mL/second. Follow Gadavist injection with a normal saline flush to ensure complete administration of the contrast. Post contrast MRI can commence immediately following contrast administration. Administer Gadavist as an intravenous bolus by power injector, followed by a normal saline flush to ensure complete administration of the contrast. Start image acquisition following contrast administration and then repeat sequentially to determine peak intensity and wash-out. Image acquisition should coincide with peak arterial concentration, which varies among patients. Administer Gadavist by power injector, at a flow rate of approximately 1.5 mL/second, followed by a 30 mL normal saline flush at the same rate to ensure complete administration of the contrast. Administer Gadavist by power injector or manually, followed by a normal saline flush to ensure complete administration of the contrast. Visually inspect Gadavist for particulate matter and discoloration prior to administration. Do not use the solution if it is discolored, if particulate matter is present or if the container appears damaged. Do not mix Gadavist with other medications and do not administer Gadavist in the same intravenous line simultaneously with other medications because of the potential for chemical incompatibility. Draw Gadavist into the syringe immediately before use. Do not pierce the rubber stopper more than once. Discard any unused vial contents. Remove the tip cap from the pre-filled syringe immediately before use. Discard any unused syringe contents. Gadavist is a sterile, clear, and colorless to pale yellow solution for injection containing 604.72 mg gadobutrol per mL (equivalent to 1 mmol gadobutrol/mL) supplied in single-dose vials and pre-filled disposable syringes. Gadavist is contraindicated in patients with history of severe hypersensitivity reactions to Gadavist. Gadolinium-based contrast agents (GBCAs) increase the risk for nephrogenic systemic fibrosis (NSF) among patients with impaired elimination of the drugs. Avoid use of GBCAs among these patients unless the diagnostic information is essential and not available with non-contrast MRI or other modalities. The GBCA-associated NSF risk appears highest for patients with chronic, severe kidney disease (GFR < 30 mL/min/1.73m2) as well as patients with acute kidney injury. The risk appears lower for patients with chronic, moderate kidney disease (GFR 30 to 59 mL/min/1.73m2) and little, if any, for patients with chronic, mild kidney disease (GFR 60 to 89 mL/min/1.73m2). NSF may result in fatal or debilitating fibrosis affecting the skin, muscle and internal organs. Report any diagnosis of NSF following Gadavist administration to Bayer Healthcare (1-888-842-2937) or FDA (1-800-FDA-1088 or www.fda.gov/medwatch). Screen patients for acute kidney injury and other conditions that may reduce renal function. Features of acute kidney injury consist of rapid (over hours to days) and usually reversible decrease in kidney function, commonly in the setting of surgery, severe infection, injury or drug-induced kidney toxicity. Serum creatinine levels and estimated GFR may not reliably assess renal function in the setting of acute kidney injury. For patients at risk for chronically reduced renal function (for example, age > 60 years, diabetes mellitus or chronic hypertension), estimate the GFR through laboratory testing. Among the factors that may increase the risk for NSF are repeated or higher than recommended doses of a GBCA and degree of renal impairment at the time of exposure. Record the specific GBCA and the dose administered to a patient. For patients at highest risk for NSF, do not exceed the recommended Gadavist dose and allow a sufficient period of time for elimination of the drug prior to re-administration. For patients receiving hemodialysis, consider the prompt initiation of hemodialysis following the administration of a GBCA in order to enhance the contrast agent’s elimination [see Use in Specific Populations (8.6) and Clinical Pharmacology (12.3)]. The usefulness of hemodialysis in the prevention of NSF is unknown [see Clinical Pharmacology (12.3)]. Anaphylactic and other hypersensitivity reactions with cardiovascular, respiratory or cutaneous manifestations, ranging from mild to severe, including death, have uncommonly occurred following Gadavist administration [see Adverse Reactions (6)]. Before Gadavist administration, assess all patients for any history of a reaction to contrast media, bronchial asthma and/or allergic disorders. These patients may have an increased risk for a hypersensitivity reaction to Gadavist. Administer Gadavist only in situations where trained personnel and therapies are promptly available for the treatment of hypersensitivity reactions, including personnel trained in resuscitation. Most hypersensitivity reactions to Gadavist have occurred within half an hour after administration. Delayed reactions can occur up to several days after administration. Observe patients for signs and symptoms of hypersensitivity reactions during and following Gadavist administration. Gadolinium is retained for months or years in several organs. The highest concentrations (nanomoles per gram of tissue) have been identified in the bone, followed by other organs (for example, brain, skin, kidney, liver, and spleen). The duration of retention also varies by tissue and is longest in bone. Linear GBCAs cause more retention than macrocyclic GBCAs. At equivalent doses, gadolinium retention varies among the linear agents with Omniscan (gadodiamide) and Optimark (gadoversetamide) causing greater retention than other linear agents [Eovist (gadoxetate disodium), Magnevist (gadopentetate dimeglumine),MultiHance (gadobenate dimeglumine)]. Retention is lowest and similar among the macrocyclic GBCAs [Dotarem (gadoterate meglumine), Gadavist (gadobutrol), ProHance (gadoteridol)]. In patients with chronic renal impairment, acute kidney injury sometimes requiring dialysis has been observed with the use of some GBCAs. Do not exceed the recommended dose; the risk of acute kidney injury may increase with higher than recommended doses. Ensure catheter and venous patency before the injection of Gadavist. Extravasation into tissues during Gadavist administration may result in moderate irritation [see Nonclinical Toxicology (13.2)]. Gadavist MRI of the breast overestimated the histologically confirmed extent of malignancy in the diseased breast in up to 50% of the patients [see Clinical Studies (14.2)]. The performance of Gadavist MRA for detecting arterial segments with significant stenosis (>50% renal, >70% supra-aortic) has not been shown to exceed 55%. Therefore, a negative MRA study alone should not be used to rule out significant stenosis [see Clinical Studies (14.3)]. Nephrogenic Systemic Fibrosis (NSF) [see Boxed Warning and Warnings and Precautions (5.1)]. Hypersensitivity reactions [see Contraindications (4) and Warnings and Precautions (5.2)]. The adverse reactions described in this section reflect Gadavist exposure in 6,809 subjects (including 184 pediatric patients, ages 0 to 17 years) with the majority receiving the recommended dose. Approximately 51% of the subjects were male and the ethnic distribution was 61% Caucasian, 29% Asian, 5% Hispanic, 2% Black, and 3% patients of other ethnic groups. The average age was 56 years (range from 1 week to 93 years). Overall, approximately 4% of subjects reported one or more adverse reactions during a follow-up period that ranged from 24 hours to 7 days after Gadavist administration. Adverse reactions associated with the use of Gadavist were usually mild to moderate in severity and transient in nature. Table 2 lists adverse reactions that occurred in ≥ 0.1% subjects who received Gadavist. Adverse reactions that occurred with a frequency of < 0.1% in subjects who received Gadavist include: loss of consciousness, convulsion, parosmia, tachycardia, palpitation, dry mouth, malaise and feeling cold. The following additional adverse reactions have been reported during postmarketing use of Gadavist. Because these reactions are reported voluntarily from a population of uncertain size, it is not possible to reliably estimate their frequency or establish a causal relationship to drug exposure. General Disorders and Administration Site Conditions: Adverse events with variable onset and duration have been reported after GBCA administration [see Warnings and Precautions (5.3)]. These include fatigue, asthenia, pain syndromes, and heterogeneous clusters of symptoms in the neurological, cutaneous, and musculoskeletal systems . GBCAs cross the placenta and result in fetal exposure and gadolinium retention. The human data on the association between GBCAs and adverse fetal outcomes are limited and inconclusive (see Data). In animal reproduction studies, although teratogenicity was not observed, embryolethality was observed in monkeys, rabbits and rats receiving intravenous gadobutrol during organogenesis at doses 8 times and above the recommended human dose. Retardation of embryonal development was observed in rabbits and rats receiving intravenous gadobutrol during organogenesis at doses 8 and 12 times, respectively, the recommended human dose [see Data]. Because of the potential risks of gadolinium to the fetus, use Gadavist only if imaging is essential during pregnancy and cannot be delayed. The estimated background risk of major birth defects and miscarriage for the indicated population is unknown. In the U.S. general population, the estimated background risk of major birth defects and miscarriage in clinically recognized pregnancies is 2 to 4% and is 15 to 20%, respectively. Embryolethality was observed when gadobutrol was administered intravenously to monkeys during organogenesis at doses 8 times the recommended single human dose (based on body surface area); gadobutrol was not maternally toxic or teratogenic at this dose. Embryolethality and retardation of embryonal development also occurred in pregnant rats receiving maternally toxic doses of gadobutrol (≥ 7.5 mmol/kg body weight; equivalent to 12 times the human dose based on body surface area) and in pregnant rabbits (≥ 2.5 mmol/kg body weight; equivalent to 8 times the recommended human dose based on body surface area). In rabbits, this finding occurred without evidence of pronounced maternal toxicity and with minimal placental transfer (0.01% of the administered dose detected in the fetuses). There are no data on the presence of gadobutrol in human milk, the effects on the breastfed infant, or the effects on milk production. However, published lactation data on other GBCAs indicate that 0.01 to 0.04% of the maternal gadolinium dose is present in breast milk and there is limited GBCA gastrointestinal absorption in the breast-fed infant. In rat lactation studies, gadobutrol was present in milk in amounts less than 0.1% of the dose intravenously administered and the gastrointestinal absorption is poor (approximately 5% of the dose orally administered was excreted in the urine). The developmental and health benefits of breastfeeding should be considered along with the mother’s clinical need for Gadavist and any potential adverse effects on the breastfed infant from Gadavist or from the underlying maternal condition. A lactating woman may consider interrupting breastfeeding and pumping and discarding breast milk up to 18 hours after Gadavist administration in order to minimize exposure to a breastfed infant. In lactating rats receiving 0.5 mmol/kg of intravenous [153Gd]-gadobutrol, 0.01% of the total administered radioactivity was transferred to the pup via maternal milk within 3 hours after administration. The safety and effectiveness of Gadavist have been established in pediatric patients born at 37 weeks gestation or later based on imaging and pharmacokinetic data in 138 patients ages 2 to 17 years and 44 patients ages 0 to less than 2 years and extrapolation from adult data. The frequency, type, and severity of adverse reactions in pediatric patients were similar to adverse reactions in adults [see Adverse Reactions (6.1)]. No dose adjustment according to age is necessary in pediatric patients [see Dosage and Administration (2.1), Clinical Pharmacology (12.3), and Clinical Studies (14.1)]. The safety and effectiveness of Gadavist have not been established in premature infants. No case of NSF associated with Gadavist or any other GBCA has been identified in pediatric patients ages 6 years and younger. Pharmacokinetic studies suggest that clearance of Gadavist is similar in pediatric patients and adults, including pediatric patients age younger than 2 years. No increased risk factor for NSF has been identified in juvenile animal studies of gadobutrol. Normal estimated GFR (eGFR) is around 30 mL/min/1.73m2 at birth and increases to mature levels around 1 year of age, reflecting growth in both glomerular function and relative body surface area. Clinical studies in pediatric patients younger than 1 year of age have been conducted in patients with the following minimum eGFR: 31 mL/min/1.73m2 (age 2 to 7 days), 38 mL/min/1.73m2 (age 8 to 28 days), 62 mL/min/1.73m2 (age 1 to 6 months), and 83 mL/min/1.73m2 (age 6 to 12 months). Single and repeat-dose toxicity studies in neonatal and juvenile rats did not reveal findings suggestive of a specific risk for use in pediatric patients including term neonates and infants. In clinical studies of Gadavist, 1,377 patients were 65 years of age and over, while 104 patients were 80 years of age and over. No overall differences in safety or effectiveness were observed between these subjects and younger subjects, and other reported clinical experience has not identified differences in responses between the elderly and younger patients. In general, use of Gadavist in elderly patients should be cautious, reflecting the greater frequency of impaired renal function and concomitant disease or other drug therapy. No dose adjustment according to age is necessary in this population. Prior to administration of Gadavist, screen all patients for renal dysfunction by obtaining a history and/or laboratory tests [see Warnings and Precautions (5.1)]. No dosage adjustment is recommended for patients with renal impairment. Gadavist can be removed from the body by hemodialysis [see Warnings and Precautions (5.1) and Clinical Pharmacology (12.3)]. The maximum dose of Gadavist tested in healthy volunteers, 1.5 mL/kg body weight (1.5 mmol/kg; 15 times the recommended dose), was tolerated in a manner similar to lower doses. Gadavist can be removed by hemodialysis [see Use in Specific Populations (8.6) and Clinical Pharmacology (12.3)]. Gadavist (gadobutrol) injection is a paramagnetic macrocyclic contrast agent administered for magnetic resonance imaging. The chemical name for gadobutrol is 10–[(1SR,2RS)–2,3–dihydroxy–1–hydroxymethylpropyl]–1,4,7,10–tetraazacyclododecane–1,4,7–triacetic acid, gadolinium complex. Gadobutrol has a molecular formula of C18H31GdN4O9 and a molecular weight of 604.72. Gadavist is a sterile, clear, colorless to pale yellow solution containing 604.72 mg gadobutrol per mL (equivalent to 1 mmol/mL) as the active ingredient and the excipients calcobutrol sodium, trometamol, hydrochloric acid (for pH adjustment) and water for injection. Gadavist contains no preservatives. The thermodynamic stability constants for gadobutrol (log Ktherm and log Kcond at pH 7.4) are 21.8 and 15.3, respectively. When placed in a magnetic field, Gadavist shortens the T1 and T2 relaxation times. The extent of decrease of T1 and T2 relaxation times, and therefore the amount of signal enhancement obtained from Gadavist, is based upon several factors including the concentration of Gadavist in the tissue, the field strength of the MRI system, and the relative ratio of the longitudinal and transverse relaxation times. At the recommended dose, the T1 shortening effect is observed with greatest sensitivity in T1-weighted magnetic resonance sequences. In T2*-weighted sequences the induction of local magnetic field inhomogeneities by the large magnetic moment of gadolinium and at high concentrations (during bolus injection) leads to a signal decrease. Gadavist leads to distinct shortening of the relaxation times even in low concentrations. At pH 7, 37°C and 1.5 T, the relaxivity (r1) - determined from the influence on the relaxation times (T1) of protons in plasma - is 5.2 L/(mmol·sec) and the relaxivity (r2) - determined from the influence on the relaxation times (T2) - is 6.1 L/(mmol·sec). These relaxivities display only slight dependence on the strength of the magnetic field. The T1 shortening effect of paramagnetic contrast agents is dependent on concentration and r1 relaxivity (see Table 3). This may improve tissue visualization. Compared to 0.5 molar gadolinium-based contrast agents, the higher concentration of Gadavist results in half the volume of administration and a more compact contrast bolus injection. At the site of imaging, the relative height and width of the time intensity curve for Gadavist varies as a function of imaging location and multiple patient, injection, and device-specific factors. Gadavist is a water-soluble, hydrophilic compound with a partition coefficient between n-butanol and buffer at pH 7.6 of about 0.006. After intravenous administration, gadobutrol is rapidly distributed in the extracellular space. After a gadobutrol dose of 0.1 mmol/kg body weight, an average level of 0.59 mmol gadobutrol/L was measured in plasma 2 minutes after the injection and 0.3 mmol gadobutrol/L 60 minutes after the injection. Gadobutrol does not display any particular protein binding. Following GBCA administration, gadolinium is present for months or years in brain, bone, skin, and other organs [see Warnings and Precautions (5.3)]. Values for AUC, body weight normalized plasma clearance and half-life are given in Table 4, below. Gadobutrol is excreted in an unchanged form via the kidneys. In healthy subjects, renal clearance of gadobutrol is 1.1 to 1.7 mL/(min∙kg) and thus comparable to the renal clearance of inulin, confirming that gadobutrol is eliminated by glomerular filtration. Within two hours after intravenous administration more than 50% and within 12 hours more than 90% of the given dose is eliminated via the urine. Extra-renal elimination is negligible. Gender has no clinically relevant effect on the pharmacokinetics of gadobutrol. A single IV dose of 0.1 mmol/kg Gadavist was administered to 15 elderly and 16 non-elderly subjects. AUC was slightly higher and clearance slightly lower in elderly subjects as compared to non-elderly subjects [see Use in Specific Populations (8.5)]. The pharmacokinetics of gadobutrol were evaluated in two studies in a total of 130 patients age 2 to less than 18 years and in 43 patients less than 2 years of age (including term neonates). Patients received a single intravenous dose of 0.1 mmol/kg of Gadavist. The pharmacokinetic profile of gadobutrol in pediatric patients is similar to that in adults, resulting in similar values for AUC, body weight normalized plasma clearance, as well as elimination half-life. Approximately 99% (median value) of the dose was recovered in urine within 6 hours (this information was derived from the 2 to less than 18 year old age group). In patients with impaired renal function, the serum half-life of gadobutrol is prolonged and correlated with the reduction in creatinine clearance. After intravenous injection of 0.1 mmol gadobutrol/kg body weight, the elimination half-life was 5.8 ± 2.4 hours in mild to moderately impaired patients (80 > CLCR > 30 mL/min) and 17.6 ± 6.2 hours in severely impaired patients not on dialysis (CLCR < 30 mL/min). The mean AUC of gadobutrol in patients with normal renal function was 1.1 ± 0.1 mmol∙h/L, compared to 4.0 ± 1.8 mmol∙h/L in patients with mild to moderate renal impairment and 11.5 ± 4.3 mmol∙h/L in patients with severe renal impairment. Complete recovery in the urine was seen in patients with mild or moderate renal impairment within 72 hours. In patients with severely impaired renal function about 80% of the administered dose was recovered in the urine within 5 days. No carcinogenicity studies of gadobutrol have been conducted. Gadobutrol was not mutagenic in in vitro reverse mutation tests in bacteria, in the HGPRT (hypoxanthine-guanine phosphoribosyl transferase) test using cultured Chinese hamster V79 cells, or in chromosome aberration tests in human peripheral blood lymphocytes, and was negative in an in vivo micronucleus test in mice after intravenous injection of 0.5 mmol/kg. Gadobutrol had no effect on fertility and general reproductive performance of male and female rats when given in doses 12.2 times the human equivalent dose (based on body surface area). Local intolerance reactions, including moderate irritation associated with infiltration of inflammatory cells was observed after paravenous administration to rabbits, suggesting the possibility of occurrence of local irritation if the contrast medium leaks around veins in a clinical setting [see Warnings and Precautions (5.5)]. Patients referred for MRI of the central nervous system with contrast were enrolled in two clinical trials that evaluated the visualization characteristics of lesions. In both studies, patients underwent a baseline, pre-contrast MRI prior to administration of Gadavist at a dose of 0.1 mmol/kg, followed by a post-contrast MRI. In Study A, patients also underwent an MRI before and after the administration of gadoteridol. The studies were designed to demonstrate superiority of Gadavist MRI to non-contrast MRI for lesion visualization. For both studies, pre-contrast and pre-plus-post contrast images (paired images) were independently evaluated by three readers for contrast enhancement and border delineation using a scale of 1 to 4, and for internal morphology using a scale of 1 to 3 (Table 5). Lesion counting was also performed to demonstrate non-inferiority of paired Gadavist image sets to pre-contrast MRI. Readers were blinded to clinical information. Efficacy was determined in 657 subjects. The average age was 49 years (range 18 to 85 years) and 42% were male. The ethnic representations were 39% Caucasian, 4% Black, 16% Hispanic, 38% Asian, and 3% of other ethnic groups. Table 6 shows a comparison of visualization results between paired images and pre-contrast images. Gadavist provided a statistically significant improvement for each of the three lesion visualization parameters when averaged across three independent readers for each study. Performances of Gadavist and gadoteridol for visualization parameters were similar. Regarding the number of lesions detected, Study B met the prespecified noninferiority margin of -0.35 for paired read versus pre-contrast read while in Study A, Gadavist and gadoteridol did not. For the visualization endpoints contrast enhancement, border delineation, and internal morphology, the percentage of patients scoring higher for paired images compared to pre-contrast images ranged from 93% to 99% for Study A, and 95% to 97% for Study B. For both studies, the mean number of lesions detected on paired images exceeded that of the pre-contrast images; 37% for Study A and 24% for Study B. There were 29% and 11% of subjects in which the pre-contrast images detected more lesions for Study A and Study B, respectively. The percentage of patients whose average reader mean score changed by ≤ 0, up to 1, up to 2, and ≥ 2 scoring categories presented in Table 5 is shown in Table 7. The categorical improvement of (≤ 0) represents higher (< 0) or identical (= 0) scores for the pre-contrast read, the categories with scores > 0 represent the magnitude of improvement seen for the paired read. For both studies, the improvement of visualization endpoints in paired Gadavist images compared to pre-contrast images resulted in improved assessment of normal and abnormal CNS anatomy. Two studies in 44 pediatric patients age younger than 2 years and 135 pediatric patients age 2 to less than 18 years with CNS and non-CNS lesions supported extrapolation of adult CNS efficacy findings. For example, comparing pre vs paired pre- and post-contrast images, investigators selected the best of four descriptors under the heading, “Visualization of lesion-internal morphology (lesion characterization) or homogeneity of vessel enhancement” for 27/44 (62% = pre) vs 43/44 (98% = paired) MR images from patients age 0 to less than 2 years and 106/135 (78% = pre) vs 108/135 (80% = paired) MR images from patients age 2 to less than 18 years. Patients with recently diagnosed breast cancer were enrolled in two identical clinical trials to evaluate the ability of Gadavist to assess the presence and extent of malignant breast disease prior to surgery. Patients underwent non-contrast breast MRI (BMR) prior to Gadavist (0.1 mmol/kg) breast MRI. BMR images and Gadavist BMR (combined contrast plus non-contrast) images were independently evaluated in each study by three readers blinded to clinical information. In separate reading sessions the BMR images and Gadavist BMR images were also interpreted together with X-ray mammography images (XRM). The studies evaluated 787 patients: Study 1 enrolled 390 women with an average age of 56 years, 74% were white, 25% Asian, 0.5% black, and 0.5% other; Study 2 enrolled 396 women and 1 man with an average age of 57 years, 71% were white, 24% Asian, 3% black, and 2% other. The readers assessed 5 regions per breast for the presence of malignancy using each reading modality. The readings were compared to an independent standard of truth (SoT) consisting of histopathology for all regions where excisions were made and tissue evaluated. XRM plus ultrasound was used for all other regions. The assessment of malignant disease was performed using a region based within-subject sensitivity. Sensitivity for each reading modality was defined as the mean of the percentage of malignant breast regions correctly interpreted for each subject. The within-subject sensitivity of Gadavist BMR was superior to that of BMR. The lower bound of the 95% Confidence Interval (CI) for the difference in within-subject sensitivity ranged from 19% to 42% for Study 1 and from 12% to 27% for Study 2. The within-subject sensitivity for Gadavist BMR and BMR as well as for Gadavist BMR plus XRM and BMR plus XRM is presented in Table 8. Three additional readers in each study read XRM alone. For these readers over both studies, sensitivity ranged from 68% to 73% and specificity in non-malignant breasts ranged from 86% to 94%. In breasts with malignancy, a false positive detection rate was calculated as the percentage of subjects for which the readers assessed a region as malignant which could not be verified by SoT. The false positive detection rates for Gadavist BMR ranged from 39% to 53% (95% CI Upper Bounds ranged from 44% to 58%). Patients with known or suspected disease of the supra-aortic arteries (for evaluation up to but excluding the basilar artery) were enrolled in Study C, and patients with known or suspected disease of the renal arteries were enrolled in Study D. In both studies, non-contrast, 2D time-of-flight (ToF) magnetic resonance angiography (MRA) was performed prior to Gadavist MRA using a single intravenous injection of 0.1 mmol/kg. The injection rate of 1.5 mL/second was selected to extend the injection duration to at least half of the imaging duration. Imaging was performed with parallel-channel, 1.5T MRI devices and an automatic bolus tracking technique to trigger the image acquisition following Gadavist administration using elliptically encoded, T1-weighted, 3D gradient-echo image acquisition and single breath hold. Three central readers blinded to clinical information interpreted the ToF and Gadavist MRA images. Three additional central readers interpreted separately acquired computed tomographic angiography (CTA) images, which were used as the standard of reference (SoR) in each study. The studies included 749 subjects: 457 were evaluated in Study C, with an average age of 68 (range 25–93); 64% were male; 80% white, 28% black, and 16% Asian. An additional 292 subjects were evaluated in Study D, with an average age of 55 (range 18–88); 54% were male; 68% white, 7% black, and 22% Asian. Efficacy was evaluated based on anatomical visualization and performance for distinguishing between normal and abnormal anatomy. The visualization metric depended on whether readers selected, “Yes, it can be visualized along its entire length...” when responding to the question, “Is this segment assessable?” Twenty-one segments in Study C and six segments in Study D were presented per subject to each reader. The performance metrics, sensitivity and specificity, depended on digital caliper-based quantitation of arterial narrowing in visualized, non-occluded, abnormal-appearing segments. Significant stenosis was defined as at least 70% in Study C and 50% in Study D. Performance of Gadavist MRA compared to ToF MRA was calculated using an imputation method for non-visualized segments by assigning them as a 50% match with SoR and a 50% mismatch. Performance of Gadavist MRA compared to a pre-specified threshold of 50% was calculated after excluding non-visualized segments. Measurement variability and visualization of accessory renal arteries was also evaluated. Results were analyzed for each of the three central readers. Number of segments varied between readers; number for majority-reader shown . Standard of Reference based on aggregate interpretation of three central CTA readers. 95.1/95% (Study C/D) confidence interval for two-sided comparison. 90.1/90% (Study C/D) confidence interval for one-sided comparison against non-inferiority margin of -7.5. GAD MRA = Post-contrast Gadavist Magnetic Resonance Angiography, ToF = Non-contrast 2D-Time of Flight. For all three supra-aortic artery readers in Study C, the lower bound of confidence for the sensitivity of Gadavist MRA did not exceed 54%. For all three renal artery readers in Study D, the lower bound of confidence for the sensitivity of Gadavist MRA did not exceed 46%. For both MRA and CTA, readers varied in the quantity of narrowing they assigned to the same arterial segments. Table 11 shows the percentage of patients in whom the measurement range was 30% or greater for the left or right internal carotid and proximal renal artery segments. There were approximately four measurements per patient segment, one from the site and three central readers. Measurement variability was high for both CTA and MRA, but numerically lower for Gadavist compared to non-contrast ToF MRA. Of 1752 main arteries visualized by the central CTA readers, 266 (15%) were also associated with positive visualization of at least one accessory (duplicate) artery. With the central MRA readers, the comparable rates were 232 of 1752 (13%) for Gadavist MRA compared to 53 of 1752 (3%) for ToF MRA. Should freezing occur, Gadavist should be brought to room temperature before use. If allowed to stand at room temperature, Gadavist should return to a clear and colorless to pale yellow solution. Visually inspect Gadavist for particulate matter and discoloration prior to administration. Do not use the solution if it is discolored, if particulate matter is present or if the container appears damaged. Instruct the patients to contact their physician if they develop signs or symptoms of NSF following Gadavist administration, such as burning, itching, swelling, scaling, hardening and tightening of the skin; red or dark patches on the skin; stiffness in joints with trouble moving, bending or straightening the arms, hands, legs or feet; pain in the hip bones or ribs; or muscle weakness. © 2011, Bayer HealthCare Pharmaceuticals Inc.
Gadavist is a prescription medicine called a gadolinium-based contrast agent (GBCA). Gadavist, like other GBCAs, is injected into your vein and used with a magnetic resonance imaging (MRI) scanner. An MRI exam with a GBCA, including Gadavist, helps your doctor to see problems better than an MRI exam without a GBCA. What is the most important information I should know about Gadavist? 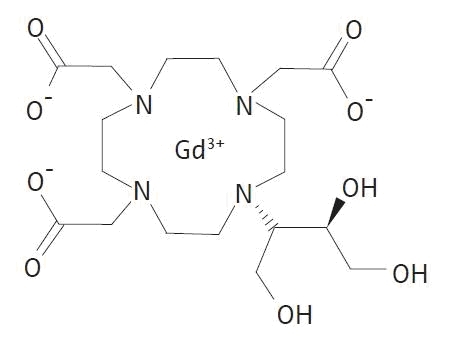 Gadavist contains a metal called gadolinium. Small amounts of gadolinium can stay in your body including the brain, bones, skin and other parts of your body for a long time (several months to years). Some people with kidney problems who get gadolinium medicines can develop a condition with severe thickening of the skin, muscles and other organs in the body (nephrogenic systemic fibrosis). Your healthcare provider should screen you to see how well your kidneys are working before you receive Gadavist. Do not receive Gadavist if you have had a severe allergic reaction to Gadavist. are pregnant or plan to become pregnant. It is not known if Gadavist can harm your unborn baby. Talk to your healthcare provider about the possible risks to an unborn baby if a GBCA such as Gadavist is received during pregnancy. What are the possible side effects of Gadavist? Allergic reactions. Gadavist can cause allergic reactions that can sometimes be serious. Your healthcare provider will monitor you closely for symptoms of an allergic reaction. The most common side effects of Gadavist include: headache, nausea, and dizziness. These are not all the possible side effects of Gadavist. General information about the safe and effective use of Gadavist. Medicines are sometimes prescribed for purposes other than those listed in a Medication Guide. You can ask your healthcare provider for information about Gadavist that is written for health professionals. What are the ingredients in Gadavist? © 2011, Bayer HealthCare Pharmaceuticals Inc. All rights reserved. For more information, go to www.gadavist.com or call 1-888-842-2937.